Palo Santo (Burseara Graveolens) or "Holy Wood" is a tree that grows on the coast of South America and is related to Frankincense, Myrrh and Copal. It is an aromatic wood used for centuries by the Incas and other cultures as a spiritual remedy. Used for incense and smudging it creates a pleasant, fresh smelling smoke with hints of mint and citrus with underlying notes of frankincense. 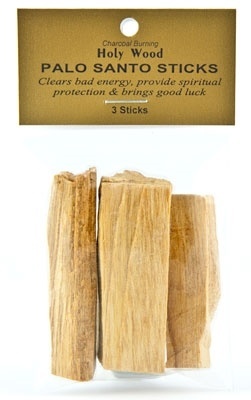 Thought to purge bad spirits, it is also said that it enhances creativity and brings good fortune. Size of sticks may vary between 1.5" to 2.5". Peruvians harvest fallen branches and twigs of the B. graveolens tree, a practice that is regulated by the government of Peru, so trees are not cut for wood harvesting. WHITE SAGE & ROSEMARY 4"